The recent death of Keith Brown and the celebration of his life held in Bloomington, Indiana in October has brought together many of us who knew and/or studied with him. Even if they never met him, I'd guess that most trombone players around the world have had one of his over 60 editions of etudes, orchestral excerpts, and solos published by International Music cross their music stands. Peter Ellefson, Professor of Trombone at Indiana University, noticed something a few weeks ago that has a few of us scratching our heads. Keith published an edition of K[arl] Stephanovsky's 20 Studies for bass trombone in 1964 (IMC 2412) and an edition of Fritz Werner's 38 Studies for trombone in 1965 (IMC 2264). What Pete noticed the other day - and why others of us never noticed this before has us scratching our heads as well - is that there is a lot of common material between the two books. 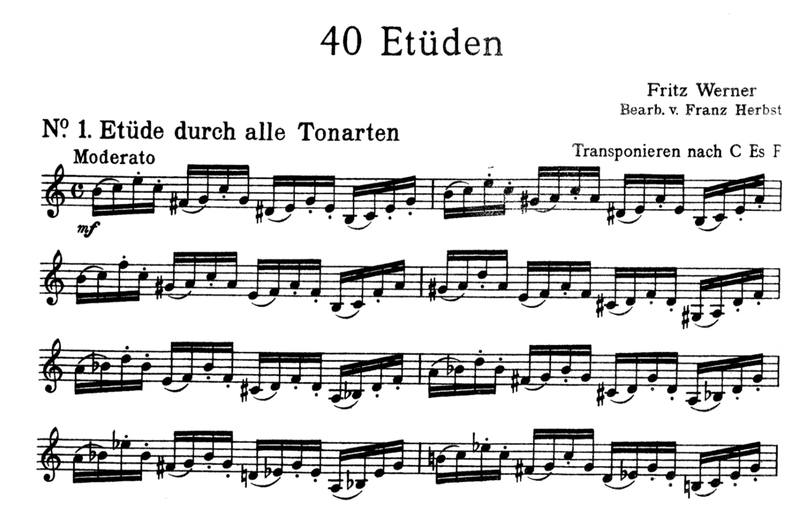 Brown's edition of Werner's studies is based on Werner's 40 Etüden for Trumpet oder Cornet à Piston, published by Rühle & Wendling in Wiesbaden in 1927, edited by Franz Herbst. His edition of Stephanovsky's studies is based on a 1950 edition of the studies published in 1950 in the Soviet Union. Werner died in 1916 and I have not yet learned if his 40 Etüden was published before 1927 or if Herbst's edition was the first to be published and he worked from Werner's manuscript for his edition. But what to make of the fact that Werner and Stephanovsky contain so much common material? Here we can see the same etude in four publications under two different composer names. There are many more as well, often with different keys and articulations, etc. And not ALL of the Stephanovsky book is derived from Werner; about 75% of the Stephanovsky book is common with Werner. I wish Keith Brown was still alive so we could ask him about this; sadly, that's not possible. But does anyone have any knowledge of this situation? The conflating of Stephanovsky with Werner came in Russia before Keith Brown made his editions. Surely there is an explanation but I can't figure out what that explanation might be. I continue to work on this puzzle but if anyone on the forum has an idea about this, I'd love to hear it. Occam's Razor suggests a fairly strightforward answer, but it's not one to throw around lightly. Having done some modest research into the dissemination of Western art and thought in China in during the Cultural Revolution, I would suggest that the political situation in the Soviet Union in the late 1940s-early 1950s should not be overlooked as a possible factor in the "transposition" of authorship of the etudes from Werner to Stephanovsky. Given the Stalinist-inspired anti-Westernization crusade in the Eastern Bloc following WW II and the degree to which all aspects of life were scrutinized for "counter-revolutionary" content and political "unreliability," particularly in regard to art in all its forms, it would certainly not be the only instance in which a work was "appropriated" (in good faith) in order to sneak it by the censors and ensure its continuing availability, if that was, in fact, what happened.